I went to my allotment yesterday morning to harvest & when I go I usually take my binoculars but didn't bother as I wasn't going to be there long. Anyway, I heard the Gulls screaming at something so looked up to see them mobbing an Osprey! I had to do a double take, I'm used to seeing them in Scotland & obviously they are now on their way to Africa for the winter but have never seen one this close to home before! I sent a text to a local chap who did a round robin text as it was heading towards the local gravel pits & it was picked up there as well as further down the bypass before heading off south! Needless to say Hubby wasn't very pleased he'd missed it!! It made my day! There are a load of ospreys in Wales, the nest sites I know of have all produced at least 3 young successfully this year. Glaslyn are yet to migrate, but I think all at the Dyfi site have gone. 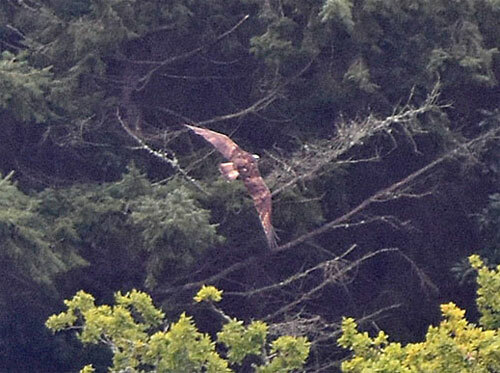 I'd never seen them until spring 2 years ago, I was out with my daughter in Wales and her partner pointed one out flying over. We found that a lot had been spotted that weekend. This year I was in Galoway & saw 3 (through my binoculars) at Threave, and 4 on the webcam screen at Caerlaverock. Better view on the screen but the parent & 2 that came back to the nest at Threave seemed more real. I've seen a distant one at Arne where they are now staying all year round. One was spotted flying over Sainsbury's in Ashford a few weeks ago (reliable source). But few and far between outside of the highlands, exception if en route to migration. You must be well chuffed ! It was great to see but would have been better with binoculars!!! Someone got a record shot of it at the gravel pits & you can just see a colour ring on its leg. Surprisingly yesterday I got a text to say there was another one at the pits which was a different one from Monday as it wasn't colour ringed! So 2 in 2 days!! Best I could do !!!!!! We have now surpassed the excitement of the Osprey over our allotment in the autumn by the fact that yesterday (Sunday) we had one over the garden!! Best bird we have on our garden list in 23 years of living here!! Quickly texted local chap to let him know it was heading to the next village, he phoned & whilst talking to him, it came back over again then went to next village where it was harassed by Gulls & Corvids. It was seen again by us & other chap! We are guessing it obviously wanted to feed but got harassed each time he/she went to water. It certainly made our Sunday!!! Wow, what a red letter day for you! Best we've had is the village wild peacock in our garden years since, and yesterday, a moorhen flew in, which was a first. One flew over Bramhall (Cheshire) last Sunday too. That really is something special !! I shall be venturing around Hampshire very shortly, the New Forest is supposed to have some Goshawks, another bird I have yet to see. But an Osprey so close.......!!!!! It certainly was a red letter day! We usually wait to see them in Scotland but was fab to see one again so close to home! Richard, good luck with the Goshawk, we've seen them but distantly. We must try harder! !